Create smooth, round pastries, hors d'oeuvres, and more with this Ateco 5457 12-piece round plain cutter set. Made of durable stainless steel, this set is resistant to rust and does not bend out of shape. Each cutter is 1 1/4" tall and includes a rounded top edge, providing a broad and comfortable surface area to safely grip and maneuver the cutter. Ranging from 7/8" - 4 2/5" wide, this size variety is great for numerous unique functions. The smallest cutter is ideal for creating fondant cake embellishments for polka dots and more, while the largest cutter produces perfectly round decadent desserts or appetizers. This set is nestable for compact storage in the provided round container. Use them on their own or take advantage of the nesting design further by creating unique borders using two cutters. These are amazing! Their structure is simple yet they are a great multi-tasker! They are good for cutters, ring molds, circle markers for piping and sizing gum paste or fondant balls. NOTE: Do not wash these! Only dry clean by rubbing them off! They will rust! This is a high quality set of round cutters from Ateco. They offer a variety of sizes and I use these all the time on my cakes. there are many companies that make bakery supplies. I like Ateco for being made well and their quality is worth the price !. Our cooks love these cutters. They nest (convenient and space-saving), and there's a size for every purpose. No rusting because of the stainless steel, and thick enough metal to hold their shape and hold up to use. Definitley recommend. Great for biscuits, empanadas, dumplings, doughnuts...etc... the variety of sizes is spot on! And the storage box keeps everything organized. It's a must in my kitchen. No kitchen is complete without these cookie cutters! They are so versatile! Having such a large size variety is amazing! They are very durable and work great for fondant and cookie dough. Very versatile, had them for years, used for dough cutting, and forming molds on cookie sheets for some of our thinner batters (get several sets) They can also be used in a skillet for pancakes, eggs, and some other special dishes so they cook to shape. I often use these cutters for a variety of recipes. From raviolis to crab cakes. They are easy to clean and don't bend. They come in a nice case to keep them all together as well. Love these cutters. I completely needed these sizes and I love that they all come in a complete container to stay organized. Make cutting out fondant so much easier! The Ateco 12 piece stainless steel cutter set is a must have in any kitchen/chef. This set is versatile in executing cuts that a knife just can't make. Great product! Love these round circle cutters! Have used them for everything from donuts, cookies, gumpaste flowers, biscuts, and pie crust top cutouts to hand pies! Incredible selection of options! These stainless steel round cutters are well made and easy to use. They come in every size we need and have held up well to much use and wash. The rolled top protects skin from being hurt when cutting over & over. Use these around the holidays and its so convenient its a full size run set. Can make all sorts of cookie designs. Highly recommend these cutters. Every once in awhile the need arises for cutting rounds of cake or biscuits. These work great and are sturdy, will be around for many years. I love the variety of sizes that these cutters come in. You can cut out any sizes cookie, cake, or biscuit. They are sharp and very lightweight. Perfect for cutting out fondant shapes and even cookies. Just about every size you would need. They stack inside of each other for easy storage. The Ateco 5457 12-Piece Stainless Steel Round Plain Cutter Set (August Thomsen) (Item #: 1445457 MFR #: 5457) is an excellent set of cutters for the money! I hand wash them and have never had a problem with rust. The canister makes them easy to store. I love the versatility of this set with so many sizes. Great product! Each cutter has a rounded top (the tops are turned under) , so you don't cut yourself when using any of the cutters. I have used these several times and the larger one I used to cover my ornament cupcakes. It was the perfect size. First thing to mention about this set is that it indeed include a case for the cutters. Inside the case is a foam insert which limits the movement of the cutters which helps to lengthen its life. The material of the cutters is very good and there is very little flex for the larger cutters. My use so far has been for tortellini (Cutting the dough) as well as for making biscuits. I have placed these in the dishwasher and they seem to be holding up fairly well. Keep in mind, that each dishwasher is different as well as detergent. Dishwasher detergents are really hard on metals over time. While you could go with a cheaper set which is made from Polycarbonate(5757 or the 5707), I find that plastic ones don't cut as well for certain dough and leave weird crinkles were it was cut. This is mostly due to plastic cutters being dull and flattening part of the dough at the edge. Circle cutters are great to use for cookie dough, fondant, and gumpaste. I used some to cut mini circles out of flatbread to serve pesto on for appetizers. Good quality cutter that washes easily, and makes the perfect look needed for our biscuits! They store well together and save space. Can be used for many jobs. These are great, they are very versatile for both pastry and savory applications, from cutting dough to potatoes and sliced vegetables and even doubling as a mold for items too! It is always great to have the size I want and in a tin that contains and protects them. They are sturdy and work great for my purposes. I will buy more for a wedding shower gift. These should last the young couple for their lives, or until they have kids that destroy them. I love these cutters! They are a sturdy stainless steel, and the rounded edge on top makes pushing down on them very easy! They are sharp enough to but easily, even through marshmallow and caramel! I like the different sizes that come with the set. they worked great and were easy to clean. i used them to make smiled face cookies! i would recommend these to anyone who likes to bake. i didn't know what I would use them for until i had them in my hand and got a bunch of ideas such as emoji faces! GREAT LOVE THEM! Enjoy using them for chocolate deco. just place the tempered chocolate onto a transfer sheet cut with these cutters and flip over in minutes you have deco! This set has become so useful at our small bakery! We use them for everything: from donuts to cookies to biscuits. Great quality stainless steel. I've seen some complaints about rust, but we dishwasher ours after every use and have had no issues. Recommended! This is a really great set of circle cookie cutters. It has 12 different sizes, so basically every size you could ever need. You always get sturdy, quality stainless steel cutters from Ateco. pretty much everything I use made by Ateco is high quality. these ring cutters have stood up to repeated use and they never fail to deliver. they're sharp and sturdy and great for lots of different tasks. Ateco has always made high quality pastry items. The only complain is that after lots of use they do tend to bend a little bit out of a perfect circle. Nonetheless, they are effective and punch through most items. This circle cookie cutter set is so versatile. It replaces all those circle cutters of various sizes and keeps well in the case. They cut uniform cookies of different sizes. These have been great to use. I haven't used each size, but so far they have been fine. I would recommend for quick cuts and perfect shape. Quality product and great price too. I have now different sizes for baking needs. Also easy to use for my kids when they help me bake. This set has been great! There are so many size options that it gives us the chance to vary or pastries and give them each their own appeal. they are well constructed and easy to clean. My family and I really like these cutters. The kids think it is pretty cool making all different sizes of the same cookie. We have also used them for pancakes which is fun! I bought these with the hope that they will last me a lifetime, and to all intents and purposes it looks like they will, assuming they do not get dropped. They are somewhat flimsier than I had guessed they would be based on what I read before my purchase. Most of their rigidity comes from the lip on the back side of the cutter- near the front side there is noticable movement if you squeeze them. They also are not perfectly circular- I would estimate that they deviate from a true circle by as much as 1/16 inch, which may be noticable for work with fondant, etc. Most would not mind though. The surface finish of the stainless steel was very nice and I believe these cutters will hold up well. If you are a home user like me, you can also use these as egg rings if you don't mind having eggs that are all slightly different sizes! They stayed cool enough to the touch that I was able to grab them out of the frying pan. Don't use on a teflon pan though. Have used these for a million different things and they always deliver. Biscuit cutting, cutting dumplings, molding food on a plate or to fry an egg. I even make hash browns with them on my griddle and they can stand the heat. Also easy to keep clean and it's nice having the tin to store them in so I can always find each size nicely organized. Great product. I'm very happy I purchased this cutter set.. They have came in handy for lots of different jobs. Totally would recommend these to anyone looking for these type of cutters. Definitely worth every penny.! I like these cutters but they are sharp. Watch out for how you handle them. They store nicely in the round container which is a plus for us. Great cutters, I use them for everything, from bread and pastry making to cake decorating. This is also the best price I've seen so far!!! These are perfect for baking. Easy to clean because they are stainless steel. They are very well constructed and we have not had one break on us yet. Great cutters, easy on your hand with the rolled top edge. Rings are stainless but tin they are in is not. Be sure to dry them before they go back in the holder. Amazing range of sizes and best price on the market for the quality. Had these cutters for a while and they are extremely durable! They do t bend or warp easily like other cutters around this price point. Well worth the buy! A must have in the kitchen, comes in a nice sturdy tin. Another bargain on webstaurant, and definitely worth the purchase. Cuts out nice circles different sizes.. This is a great set. I always have one that's just the size I need. The cutters are high quality. Not flimsy or easy to bend. The tin case is an added bonus because most of my sets from other brands don't come with one and can be difficult to keep organized. Beautiful and heavy duty, sharp cutters. These come in such a great range of sizes! I've used them for cookies so far, but will surely find many uses for them, including marking cakes prior to decorating, cutting gumpaste, and molding isomalt. These are very good cutters and are packaged quite nicely in a tin case. The range of sizes is quite nice - this one set will pretty much cover nearly all needs. These are a basic group of graduated, round cutters. Good for clean cuts to sugar cookie dough and puff pastry so our results are almost perfect. This set has an amazing variety of sizes! I have used it every single day since I purchased it! If you work in the cake world, you will find use after use for them! We LOVE this cutter set. We mostly use it for fondant, although it's also been used for sugar cookies. The cutters are nice and sharp, and cut very cleanly. It's great to have a nested set too! 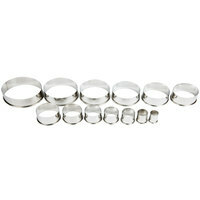 I really love this Ateco circle cookie cutter set since it comes with so many sizes, you can really play around with. High quality too! I love that it has so many different sizes! And they're very sturdy, the cleaning under the little loop is a challenge but it's easy to dry by putting it in the oven. I used these cutters for everything. They are very sturdy and do not bend when you put pressure on them. They're great for biscuits And cookies. These ring cutters are a must-have for all bakeries. I use them for all sorts of things, like cutting out mini rounds of cakes, pie shells, and fondant. this is a necessary set for any serious baker! they seem to be well made, you'll use them for many years, plus you'll have the right size for any project. A must for any pastry kits. All the sizes of round cutter you'd ever need, and it comes in a convenient case so you'll never lose any of them. This kit is probably a must-have in every baker's kitchen. The options you have are perfect for so many uses like cookies, doughnuts, ravioli, etc. They're sharp and come in a handy case. Just wash and air-dry. I like to dry mine in a warm oven to prevent any possibility of rust. These cutters are a great tool in any kitchen! They are wonderful for plating, garnishing, ring molds, and use for pastry. Very reasonably priced and conveniently packed into a simple and efficient case which helps keep them well organized. Yet another great product from Ateco! I definitely recommend this set! These are great, I have yet to find a circle size that I needed that was not included in this set. They cut with such ease. This set is great as many have said. What makes this set so great is there are so many different sizes. Furthermore, you get perfectly clean cut edges with these cutters. Oh and they are superbly round too. I specifically bought these because of the huge range in sizes it offers. They're fun to use for mini personal pizzas with the largest size. The only thing is that it's difficult to get just one out by itself, and it's easiest to just take them all out of the tin. A must have set of cookie cutters for every baker. This 12 piece round cookie cutter set has every size cutter you could need and is used for everything from cookies to biscuits to pie crusts. All the round sizes you'll ever need. I've used them for cookies, fondant, donuts, and to make round sandwiches for my kids. They're strong and cut well. This is a nice little cutter set at a great price. They are thin enough to stack neatly in small tin but sturdy enough that they are not flimsy. These round plain cutter set is very great for cutting cookies, donuts, cake decoration, cutting in the fondant and much more. I love the different size. A must-have for any baker!! Good quality metal that does not rust or warp. These should last for years. I use them for cookies, cake decorations and cupcake toppers. This is the best price I found online and really liked that it includes 12 cutters instead of 10. Another good set of cutters, my kids could play with these for hours. Very useful for patisserie work and the occasional mold for savory foods. These cutters are true multitaskers. Not only do they make short work of cookie and biscuit dough, but they also make excellent molds for shaping hamburger patties, steak tartare, and even fried eggs. They seem well made and sturdy. These were exactly what I was looking for. The size range is great and they come in a handy metal container. They cut cleanly through gum paste, fondant and cookie dough. They seem sturdy. Highly recommend ! Excellent tool to have around, I use them almost daily. Good quality and it is nice that they come in a tin to keep them all together. These cutters are used daily in our bakeshop. We simply dip them in cornstarch before we start cutting out fondant and the dough releases easily. They are also great to cutout round petite fours and shortbread dough to line our mini cheesecakes pans. I love the variety of sizes in this cutter set. From big to really small it's prefect for cookies, fondant work and even cutting out dough for hand pies. This round cutters are very functional and multipurpose. I use them to make doughnuts, cookies and for decorations in any cakes. I like that they have a lot of sizes and I can choose any of them. they are very good quality and they are made by Ateco a great company. These cutters are great! It covers a nice range of sizes. I use them to make biscuits, donuts and cakes. I would definitely recommend these! Estos cortadores son maravillosos, puedes cortar hasta galletas, hasta cortar los petalos de gumpaste flowers son muy resistentes y multiusos para todo tipo de trabajo, muy buen produccto. We use this for forming alot of our desserts as well as plating up our plates. The 12 pieces give you a good range of sizes. Ahh, such a wonderful classic to have around. You can use these in a pan for round eggs or pancakes, cut cookies, or make biscuits! I always have these round cutters in my knife kit! They are very versatile! I can use them to cut cookies or biscuits but I can also use them to put tuile around to make a loop cookie! These cutters work well for biscuits and pastries and other soft doughs. I have even used one to cut the centers out of fresh pineapple slices! Fantastic set of round cutters. These are extremely durable. I have has a set of these for about three and a half years now and they haven't broken, rusted or warped. These cutters are convenient. They really help when you need to cut out a bunch of circles for decorating. Don't like how the seem isn't flush and the cut outs aren't perfect circles. Best to go with plastic where there is no seem and it keeps it's shape. I am very pleased with this round cutter set. I mainly purchased this to cut fondant for cakes and cupcakes. Easy product to use I am happy with my purcahes. Hey guys, these round cutters are the best!! I use them all the time. I use them for cutting dough and for finishing presentation when I plate food. I'll through down some pictures and for sure check out the video I post about them!! If anyone wanted to know, I wash them by hand, I do not have a dish washer. These cutters are very sturdy. I use them for cutting fondant to decorate cakes. I have also been using them in the culinary side of cooking as well to form perfect bite sized patties. We bake all of our own bread, pastries, and desserts. These cutters are an indispensable part of our operation and do the job that they are supposed to. These are really nice quality ring cutters. Ateco is a great company and webstaurant sells a lot of their products at such a good price! Excellent cutters! Sharp edges produce clean cuts each and every time!! High quality and built to last! Worth the investment!! Great for cookies and cakes! Excellent for donuts!! I used the cutters to cut fondant small circles to top cupcakes that I made for a party. The cutters worked really well and provided clean edges. Also, the clean up is very minimal with hot soapy water. Very good quality round cutter set. I use them on just about every cake that I make. They are well made and come in a great variety of sizes and even a nice tin to keep them organized and safe. I first bought these to use as cookie cutters. I find myself using them for pastry, fondant, cake decorating and more. Very heavy duty and they come in a nice metal container.